We'd like to introduce "Daphne," a totally new style opening for pre-order April 25 - May 17 at RoyalVintageShoes.com ! Yup, Daphne is our new wedge heel and offers a casual, adorable, practical comfort and style for Spring and Summer. Based on original 1930s and 1940s designs, Daphne pairs a hard-wearing canvas textile with leather quarters. She has a small peep toe and a lace-up vamp, paired with leather soles, making Daphne a wonderfully danceable wedge as well as perfect for all-day wear. Daphne in red - the winner of our color poll! Daphne sits beautifully on our new 2 inch wedge. She's available in navy blue (yes, I said navy blue!) and red, two beautiful neutrals (yes, I said neutrals!) for your warm-weather dresses, skirts, and trousers. They're every bit as comfortable as they look, too. 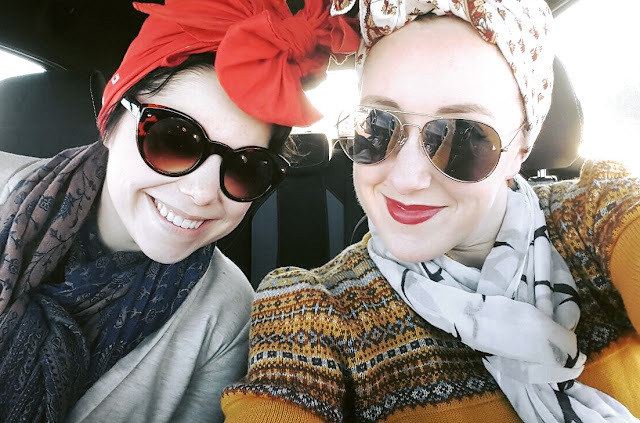 Don't miss these lovely ladies! Today I'd like to share some insider information with you...that is, how we come up with new designs and collections for the coming seasons. We usually start working on a new collection about a year in advance. It's a good time to muse and get inspired because it's the same time of year as when the new collection will come out. It's genuinely hard to design a Summer collection in the middle of Winter, and even harder to take photos when it's snowing outside, so we try to work far enough in advance to help us with mood and media both. 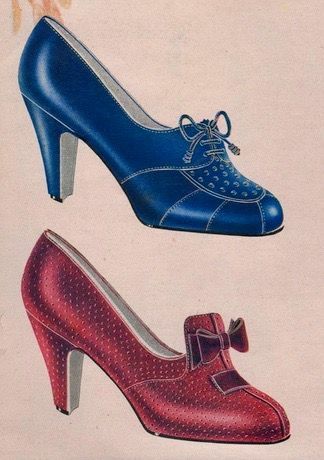 Our designs always start with original vintage shoes, advertisements, and images. Here are just two we referenced for color, bows, and tongue ideas. Speaking of mood, that's where it really all begins. Working with the design team (me, Nicole, and Abby), we throw out a bunch of ideas and feels and impressions. When we all circle around one, a color scheme starts to come together. As an example, Foxtrot Summer came from the feeling of dancing at an evening garden party on a warm night, surrounded by flowers, jazz, and champagne...then the color palette developed from several original 1930s fabrics, the kind of diaphanous printed silk chiffon found on puff-sleeves '30s tea gowns. 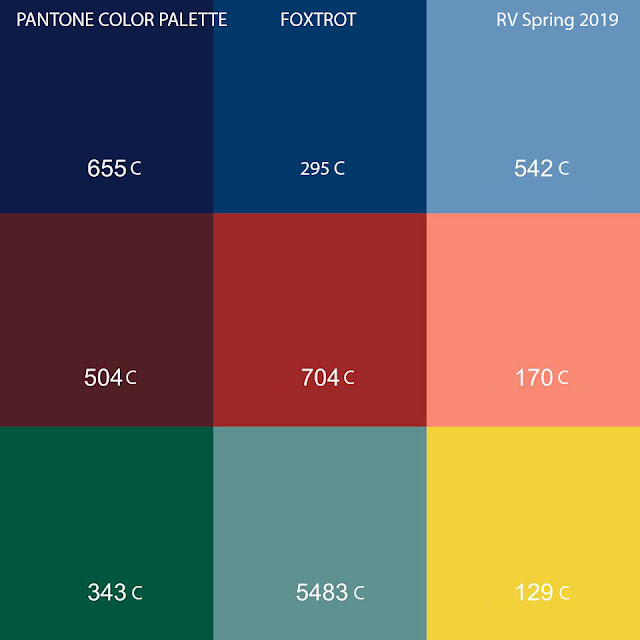 Our color palette with Pantone callouts for Foxtrot Summer 2019. 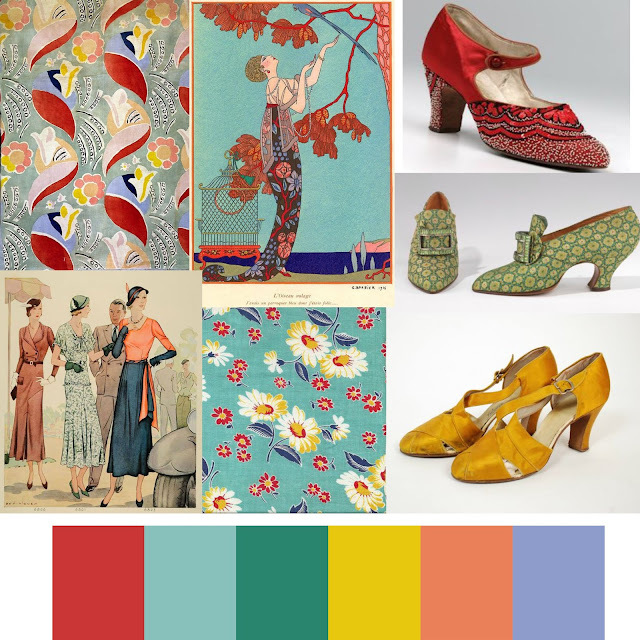 We pulled these swatches from illustrations, original shoes, textile designs, and more. Once the feel and the palette are a go, we agonize over the shoe designs themselves. We try to stick to some "rules" (guidelines, more like) in terms of what kinds of shoes to include in the collection. 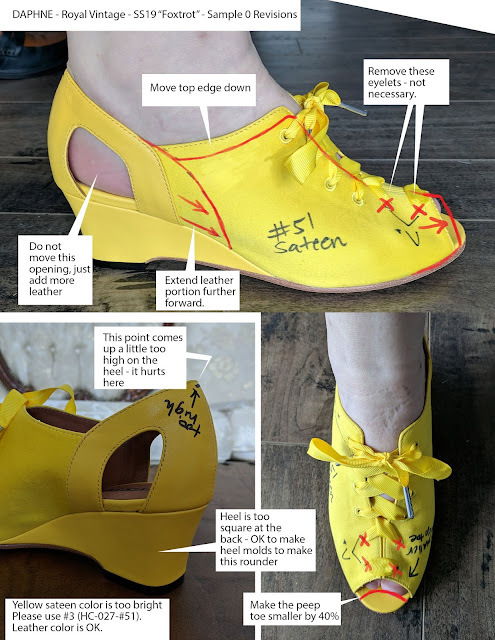 For instance, there ought to be a low-heeled or flat shoe, an oxford, a pump, a sandal if it's summer, and a nice spread over different heel shapes and heights. When designing a collection we want everything to feel cohesive. It should feel both cohesive in color palette (not TOO many reds or yellows or blues) and in style (they can't ALL be sandals). We also don't want entirely two-tones or entirely suede, etc. To keep everything balanced, we place all of the design and colorway mockups on one page together to take a look at the whole. Taking a look at the whole Foxtrot Summer collection together, to make sure everything feels balanced. We check out both style and color on this tear sheet. Once everything is approved, it's off to sampling. This is the fun part - we pick leather colors, component colors (like shoe laces and other decoration), and see the designs come to life. But it's almost never a winner right out of the gate! Sometimes colors in real life don't work so well together and we have to figure out why - for instance, is that yellow just too YELLOW? Does that blue actually work with that red? We typically go through two or three rounds of samples getting the materials, colors, and fit just right. The protoypes are almost never correct on the first try - take the first sample of Daphne, for example. WOW YELLOW, right? Fix that! But we also made a lot of changes to the design, which created a better balanced design in the second sampling round. 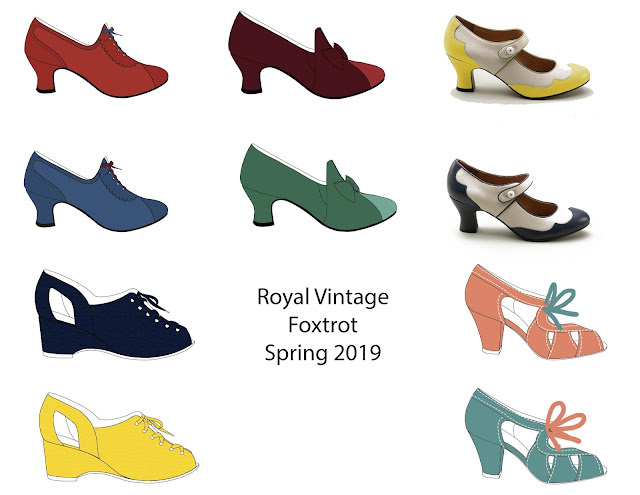 If you'd like to see the result of the examples I've shared here, head on over to RoyalVintageShoes.com - Foxtrot Summer is on pre-order April 25th - Mary 17th, 2019. "Cora," one of the new designs in the Foxtrot Summer collection. One of our most popular designs, "Lillian," is now revived in our most requested colors! 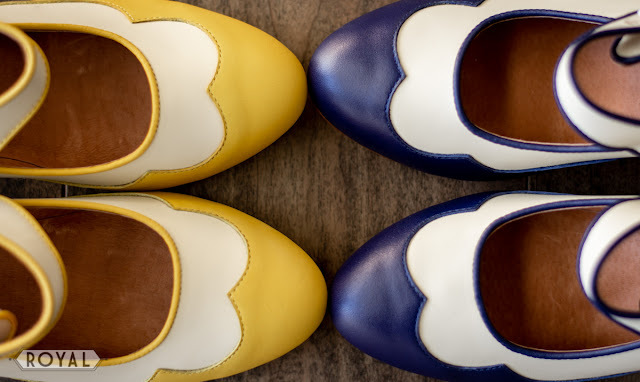 Our beautiful two-tone spectator Mary Janes, perfect for 1920s and 1930s, are now available in soft yellow/ivory as well as an updated navy blue/ivory. 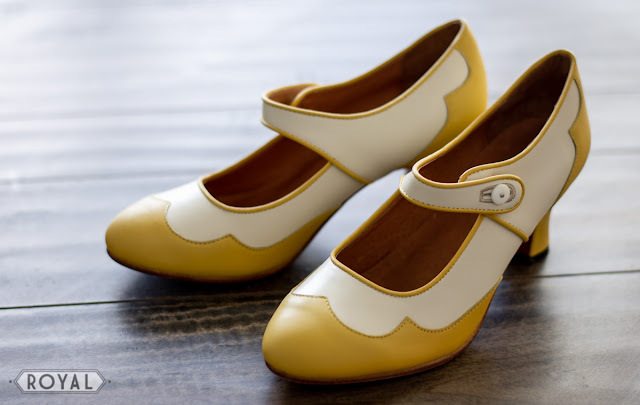 Lillian Art Deco Mary Jane Shoes in soft yellow and ivory. These are ridiculously cute! Additionally, Lillians now feature our sealed all-leather soling, making these mary jane pumps epic for dancing. The Lillians come with a true-button strap closure (move that button to make them fit perfectly, ladies! 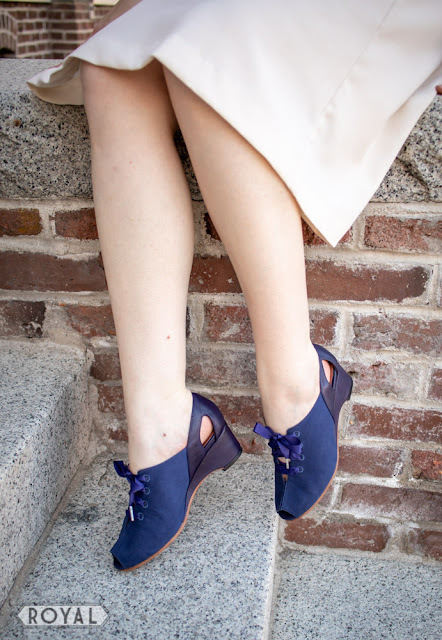 ), leather lining, and our oh-so-comfortable 2.5 inch 1930s heel. 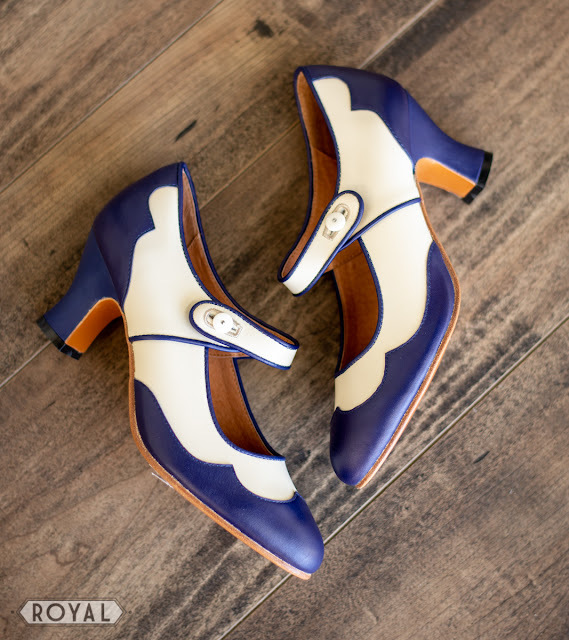 Top Seller - Lillian Art Deco Mary Janes in navy blue and ivory. Now with leather soles! We hope you love these new color options! We can't wait to see what you pair your fresh new Lillians with. We'd like to introduce Cora, our simply divine new summer sandal opening for pre-order April 25th at RoyalVintageShoes.com. Cora was inspired by the soft colors of warmer climes, whether you find the pink and turquoise in a Southwest desert landscape or kissing the waves of a South Seas sunset. It's these soft, pastel tones that feel so warm and modern but also very vintage and familiar. 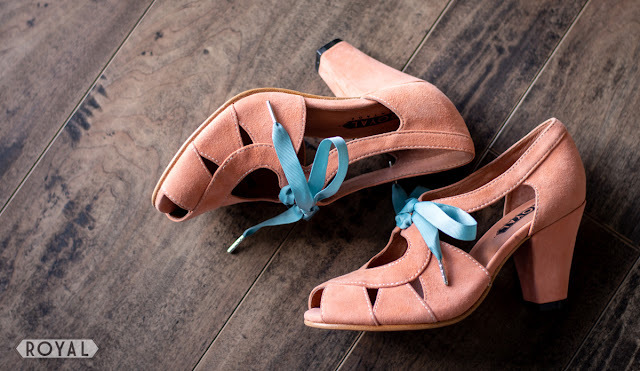 The beautiful new "Cora" suede sandals in coral, the hot color of the year. These 1940s sandals feature a small peep toe, open sides, and a 3 inch heel. They come with both contrast and matching shoe laces. 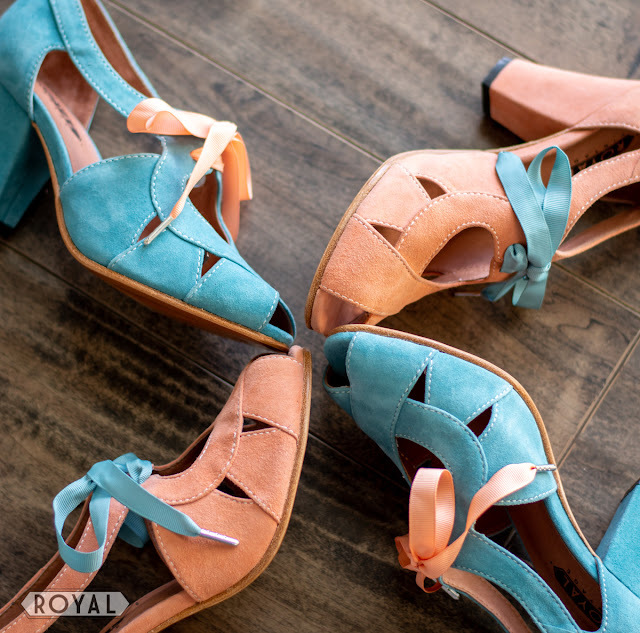 Cora's been making waves all over social media, and we think it's because she's just so pretty in her soft, very trendy coral pink suede and contrast teal ribbon lace. 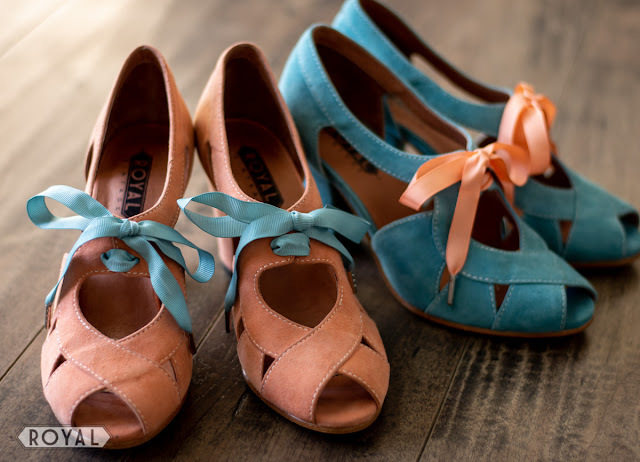 Cora also comes in teal suede with a coral lace, and every box has a matching shoe lace included too. Cora in teal is so incredibly beautiful! Cora sandals are made in luscious suede with contrast shoe laces - but we've also included a matching shoe lace in every box. The suede is butter soft, but structured enough with a leather lining. The cutout design shows just enough the foot while keeping secure. 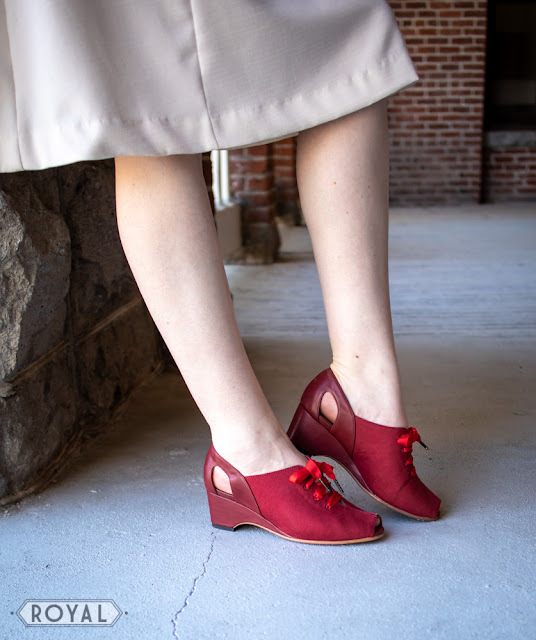 Cora stands on our 3 inch 1940s heel and the design has a small, accurate peep toe.